Nextran Service. We're Your Team. Today’s trucks are more complex than ever before. 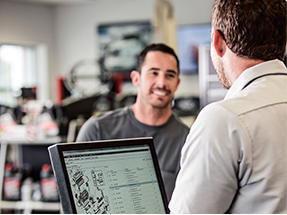 That’s why our technicians are trained and equipped with the latest diagnostic tools to guarantee your truck operates at peak performance levels. Our success relies on yours. But we understand that it’s not just schedules and performance. Trucking is a people business first. Working together, solving problems with a common purpose and sense of urgency. For more than 22 years, organizations across the nation have depended on us to keep their trucks on the highway with innovative solutions and unmatched personal service. Whether it’s maintenance, or a major overhaul, you can count on us to keep you moving forward. Keep your truck running smoothly with our Preventative Maintenance. Nextran Truck Centers’ trained technicians provide quality preventative maintenance on all makes and models of any vehicle. Nextran Truck Centers offer a full-line of service because today’s trucks are more complex than ever before. That’s why our technicians are trained and equipped with the latest diagnostic tools to guarantee your truck operates at peak performance. Here are a comprehensive list of services for Mack and Volvo. 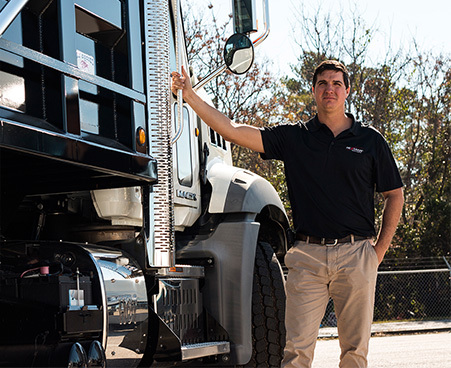 At Nextran Truck Centers, we understand how important uptime is to the industry and how important a promise is to a customer. That’s why we take our partnership with Mack and Volvo very seriously. Nextran is now apart of Mack’s Certified Uptime Center pilot program. This designation shows Nextran’s commitment to keeping our customers on the road, diagnosing and repairing trucks efficiently and effectively. At Nextran, we keep America moving forward.